WASHINGTON, D.C. – In the month of October Tyson Foods and the League of United Latin American Citizens (LULAC) are partnering together to donate five truckloads of protein to food banks in Washington, D.C. and cities in California, New York, Texas, and Florida. The first donation will take place in Washington, D.C. at the Capital Area Food Bank with the remaining distributions to take place over the following weeks. 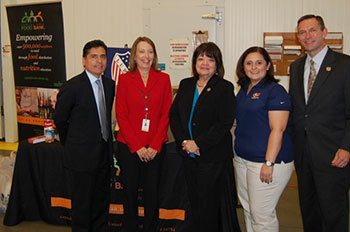 “Through our partnership with Tyson Foods we strengthen our commitment to eradicate hunger in the Latino community,” said LULAC National President Margaret Moran. “This donation will go a long way to help address food disparities for families facing economic challenges.” The donation totals 151,000 pounds of protein and will be distributed to food banks in five urban areas. The food pantries will each receive approximately 30,000 pounds. These food pantries have a strong commitment and history of eradicating food disparities in areas with high rates of childhood hunger. Tyson Foods’ current “KNOW Hunger” campaign is focused on helping more people understand and join the effort to eliminate hunger in America. The company also partners with Share Our Strength, Lift Up America, and Feeding America to raise awareness and help feed the hungry across the nation. Since 2000, Tyson Foods has donated 96 million pounds of food toward hunger relief. About Tyson Foods Tyson Foods, Inc. (NYSE: TSN), with headquarters in Springdale, Arkansas, is one of the world's largest producers of chicken, beef, pork and prepared foods that include leading brands such as Tyson®, Jimmy Dean®, Hillshire Farm®, Sara Lee®, Ball Park®, Wright®, Aidells® and State Fair®. The company was founded in 1935 by John W. Tyson, whose family has continued to lead the business with his son, Don Tyson, guiding the company for many years and grandson, John H. Tyson, serving as the current chairman of the board of directors. Tyson Foods provides a wide variety of protein-based and prepared foods products and is the recognized market leader in the retail and foodservice markets it serves, supplying customers throughout the United States and approximately 130 countries. It has approximately 124,000 Team Members employed at more than 400 facilities and offices in the United States and around the world. Through its Core Values, Code of Conduct and Team Member Bill of Rights, Tyson Foods strives to operate with integrity and trust and is committed to creating value for its shareholders, customers and Team Members. The company also strives to be faith-friendly, provide a safe work environment and serve as stewards of the animals, land and environment entrusted to it. League of United Latino American Citizens (LULAC) The League of United Latin American Citizens (LULAC) is the largest and oldest volunteer-based civil rights organization that empowers Hispanic Americans and builds strong Latino communities. Headquartered in Washington, DC, with 900 councils around the United States and Puerto Rico, LULAC’s programs, services and advocacy address the most important issues for Latinos, meeting critical needs of today and the future. For more information, visit www.lulac.org. www.facebook.com/lulac.national.dc. www.twitter.com/lulacnational. About The Capital Area Food Bank The Capital Area Food Bank is the largest hunger relief organization in the Washington metro area serving over 530,000 people through direct food distribution programs and a network of 500 partner agencies. This year, the Capital Area Food Bank distributed 42 million pounds of food – the equivalent of 35 million meals – including 17.5 million pounds of fresh fruits and vegetables. About Food Bank For New York City Food Bank For New York City, one of the country's largest food banks, has been the city’s major hunger-relief organization working to end hunger throughout the five boroughs for more than 30 years. Through its network of more than 1,000 charities and schools citywide, Food Bank provides food for more than 63 million free meals for New Yorkers in need. About the Houston Food Bank The Houston Food Bank is America’s largest food bank in distribution to its network of nearly 600 hunger relief charities in 18 southeast Texas counties. Named top charity in Texas by Charity Navigator for financial performance and accountability, the Food Bank provides 59 million nutritious meals to food pantries, soup kitchens, senior centers and other agencies, feeding 800,000 people each year. Fresh produce, meat and nonperishables are distributed from the warehouse at 535 Portwall, and hot meals are prepared and distributed from Keegan Center, a 15,000 square-foot industrial kitchen. Additional community services range from nutrition education to assistance with food stamp applications and hands-on job training. Red Barrels offer a convenient way for grocery shoppers to donate nonperishables for their neighbors in need. The Houston Food Bank, founded in 1982, is a certified member of Feeding America, the nation's food bank network. The organization plans to grow to an annual distribution of 100 million nutritious meals by 2018. Visit HoustonFoodBank.org for more information. Find us on Facebook or follow our news on Twitter. About Feeding South Florida Feeding South Florida has served the community for 33 years and serves 30% of the state's food insecure population.